The PSFS Building is a 36-story steel-framed building that rises 491 feet above street level. Polished black granite, light gray limestone, black and gray brick, and stainless steel are used to create form and massing on the building’s exterior. The building has been described as visually “sleek and streamlined” with it vertical bands and horizontal ribs. It is divided up into three sections – the base, the cantilevered office slab, and the vertical service “spine.” Howe & Lescaze were involved with the entire design of the building down to the smaller details including the sign graphics, bathroom fixtures, clocks manufactured by Cartier. The rooms on the top floor were reserved for use by the board of directors. These rooms were detailed with a mix of high-end woods, brass fixtures, and custom designed furniture. Although the building began construction after the stock market crash of 1929, the PSFS company invested high-quality materials in the construction of their building as a means of demonstrating their commitment to the future of the company. The most visible feature of the building which can be seen from a great distance away, is the 27-foot high “PSFS” roof sign that is a focal point of the Philadelphia skyline. As a result of the thoughtful use of materials and design, the building has to be an enduring presence since it opened in 1932. Commission brief: In 1926, the Philadelphia architecture firm of Mellor, Meigs, and Howe received a new commission from the Philadelphia Saving Fund Society (PSFS) for a 15-story bank and office building. The firm produces a Beaux-Arts inspired design but the project is put on hold until the company tests the feasibility of the proposed site on South 12th Street. After testing the new location for two years and confident of the site, PSFS makes the decision to move forward with the skyscraper project. Because George Howe ends his working relationship with Mellor &. Meigs during 1928, PSFS solicits design schemes from both the original firm and Howe in 1929. Upon review of the submitted schemes, they rejected the more traditional design submitted by Mellor & Meigs and opt for Howe’s modern proposal. Howe had discarded the earlier Beaux-Arts concept in favor or one that referenced ideas of the European International Style and the Chicago School. 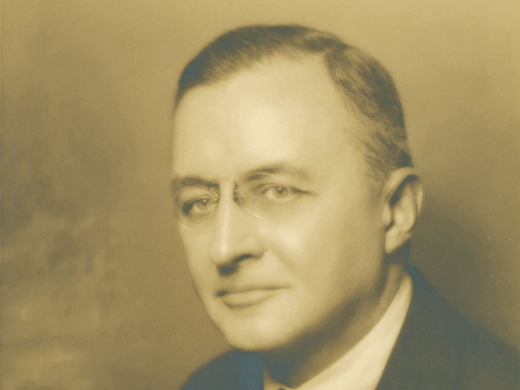 In 1929, Howe enters into a new partnership with William Lescaze. Lescaze, a Swiss-born architect, was devoted to the ideas of Modernist design. With the formation of the new partnership, the two architects begin jointly developing the design scheme for PSFS. Design brief: The design for the building evolves during 1929 and 1930. Although George Howe independently submits the original design proposal, it was after he began working with William Lescaze that the design begins to reflect the building’s final form. In July of 1930, a model of the proposed skyscraper is presented to the PSFS Building Committee. President Willcox encourages the architects to continue working the scheme. He is concerned that the detailing is too horizontal and wants a design that speaks to the verticality that will be reflective of the height of the building. By this point, the building design is 36 stories tall. Numerous variations of the scheme are worked from July to December. In early December 1930, the final design is approved by the company’s Building Committee. As part of the overall approved plan, the architects are enlisted to create designs for a range of items including lighting, bathroom fixtures, clocks, furniture and numerous other details for the buildings interior space. Building/construction: In January 1930 building plans are filed with the city of Philadelphia and excavation of the corner lot at Market Street and South 12th Street begins. The steel frame of the building begins to rise later that year and construction is completed in 1932. The PSFS skyscraper originally opened as a branch location, transitions to the company headquarters. Because of the significant increase in customers during the first two decades of the building’s life, the size of the banking hall is expanded by using existing space originally occupied by offices. Banking counters are rebuilt and the number of teller windows increased. Lighting in the hall, originally provided by desk lamps and incandescent lighting near the air conditioning units, is updated with recessed lighting throughout the banking hall ceiling. Changes in banking hall are designed by in-house architect, Alexander Hazell. As a result of issues (cracking and dislocation) with glass panes installed at the banking level, all are replaced. In this time period, all brickwork is repointed. Television tower installed on building roof. Retail stores located on the ground floor are remodeled. Property is purchased by Rubin Organization and Loews Hotel after FDIC takes over property from bankrupt Meritor Savings Bank (parent company of PSFS). Interior of property is significantly altered as it undergoes a major renovation that converts is from an office building to a luxury hotel. Updates to exterior are limited to restoration work of original materials. Rubin also purchases 18,875 square foot parcel behind PSFS building. The lot will is used for an addition that is part of the building’s conversion to the Loews Hotel. Effects of changes: Prior to 1997, general interior alterations occurred as part of PSFS business needs and general maintenance. Beginning in 1997, when the property was acquired by the Rubin Organization and Loews Hotel, the building undergoes a major interior renovation to convert it to a 550+ room hotel. The PSFS building is now owned and operated by the Loews Hotels Corporation as an upscale hotel. Now renamed, Loews Philadelphia Hotel, it features 581 guest rooms, function spaces, health club, restaurant, and other related services. The close proximity of the hotel to the Pennsylvania Convention Center was seen as a critical element to the parties who invested in the building’s conversion. As the result of a recent major renovation of the interior and restoration of exterior, the building is in excellent physical condition. Although the building is now officially Loews Philadelphia Hotel the hallmark PSFS sign on the roof has remained. Howe &. Lescaze were involved with the entire design of the building down to the smaller details including the sign graphics, bathroom fixtures, clocks manufactured by Cartier. The rooms on the top floor were reserved for use by the board of directors. These rooms were detailed with a mix of high-end woods, brass fixtures, and custom designed furniture. Although the building began construction after the stock market crash of 1929, the PSFS company invested high-quality materials in the construction of their building as a means of demonstrating their commitment to the future of the company. The most visible feature of the building which can be seen from a great distance away, is the 27-foot high “PSFS” roof sign that is a focal point of the Philadelphia skyline. As a result of the thoughtful use of materials and design, the building has to be an enduring presence since it opened in 1932. Completed situation: In November 1932 the new PSFS Building opens. The buildings modern design includes “high-speed elevators, thermostatically controlled heat, radio outlets in every office, acoustic ceiling tile carried on metal frames, a nearby garage, and most importantly, ‘manufactured weather’ or central air conditioning…” The PSFS building would boast upon completion of the second air conditioned office building in the United States (as well as the tallest). Final design of the roof includes a 27-foot neon sign. The sign, visible from 20 miles away, will transform the Philadelphia skyline and make the term “PSFS” (versus the more formal “Philadelphia Saving Fund Society”) part of local Philadelphia vernacular. Original situation or character of site: Upon completion, the 36-story PSFS Building towered over the surrounding downtown buildings. At 491 ft. high, the building was surpassed in 1932 only by the statue of William Penn on top of Philadelphia’s city hall. The PSFS building was the second air conditioned (and tallest with a/c) office building in the United States. Upon opening in 1932, the building could boast many new technological advances including aluminum ribbon windows, thermostatically controlled heat, radio outlets in every office, acoustic ceiling tile carried on metal frames, high-speed elevators, and more. The overall plan of PSFS was revolutionary not only in its forward thinking approach to its functionality but also in its mechanical systems and equipment. The construction of a modern building by the oldest and one of the most trusted banking institutions in the city altered the identity of Philadelphia. Always self-conscious as a place of rich historic tradition and buildings, the PSFS building allowed the city to evolve toward a new type of future, in which the old could readily co-exist with the new. European Modernism, Chicago School, International Style. Canonical status: It is viewed nationally and internationally as the first example of an International Style skyscraper in the United States, as well as one that masterfully executed the ideals of the style. Two exhibits, one historically notable and one more recent, are a testament to the building’s continuing influence in architecture. The first one, the building’s inclusion in the 1932 International Style exhibit organized by Henry-Russell Hitchcock and Philip Johnson at the Museum of Modern Art in New York City. The exhibit coincided closely with the opening of the building, bringing it to the immediate attention of the design community and general public. Even more recently, the 2004 exhibit Nothing More Modern held at Yale University took a close look at the evolution of the design and its embodiment of the modern. In addition to its influence upon changing architectural tastes, the PSFS building led the way for a new approach to the planning and development of office buildings in the United States, with its continued influence still seen throughout new commercial design today. The building resulted from a collaborative working relationship between the president of the company, James M. Willcox and the architects. The goal was to create a building that met the company’s business needs in addition to income producing rental office space. With the retail shops on the first floor, the PSFS banking hall on the second, and offices rising up to the 36th floor, the building was a pioneering design of “mixed-use” development.